The Azores are an archipelago that lies in the Atlantic Ocean about 1400 km west of Lisbon on the same geographical level. The archipelago extends even turn over a length of 600 km. The archipelago consists of nine inhabited and several uninhabited islands. The islands are divided into three groups. In the southeast, the group is the largest and most diverse island of São Miguel , the small island of Santa Maria , the oldest island of the archipelago, not to mention the tiny Formigas . the center of the archipelago and known as the central group in the above lists will be clearly visible volcanic island of Pico with the volcano mountain, the highest mountain in Portugal. Less than 7 km away from the lies of Faial island with the great harbor at Horta. In parallel to the long drawn Pico Island São Jorge their cliff is located along the alluvial localities (Fajas) anzeiht especially hikers. At the easternmost of the central group is the island of Terceira, the capital of Angra do Heroismo a UNESCO world heritage site was declared. A fifth of the central island group is one of the then small and rarely visited island of Graciosa to the north. 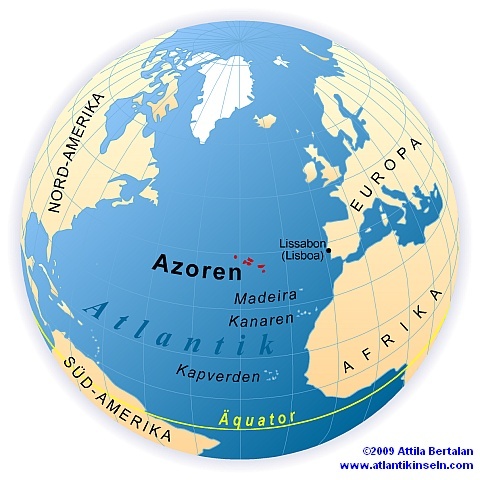 Far behind in the West we find the last group of the Azores with the two smaller islands of Flores and Corvo. The 15 km long island of Flores is considered by many visitors because of its Azores romantic nature as a scenic highlight.